Press File Photo: The leader of a Kent County veterans’ group wants to erect a fence around the monuments in Veterans’ Memorial Park. GRAND RAPIDS â With improvements being planned for a military-themed downtown park, the commander of a local veterans’ group has an idea: fence off the monuments. Grand Rapids Downtown Development Authority will convene a group to design improvements to the 1.6-acre Veterans’ Memorial Park, along Fulton Street east of Sheldon Boulevard. The middle of the park, adjacent to Grand Rapids Public Library headquarters and the Grand Rapids Children’s Museum, includes several war memorials and a reflecting pool. “There have been kids swimming in the pool, people having their grills going right there by the pool, and that kind of activity bothers me a little bit,” said Mike Burri, commander of the United Veterans Council of Kent County. “One of the things that really upset me last year was the children’s museum during ArtPrize put crayons all over the sidewalk right up to the monuments. A brownfield redevelopment deal between Grand Rapids and the developer who turned the former YMCA at 33 Library St. NE into The Fitzgerald condominiums had earmarked $747,500 in future tax revenue for park improvements. But that deal recently was amended to let the DDA do the upgrades and get reimbursed, at 4.5 percent interest, over time. Fewer-than-expected condo sales have slowed growth in property tax receipts and made it impractical for the developer to front the cost of park improvements, said Kara Wood, the city’s economic development director. Press File PhotoA sculpture placed on the grounds of Monument Park in 2006 irked some area veterans. 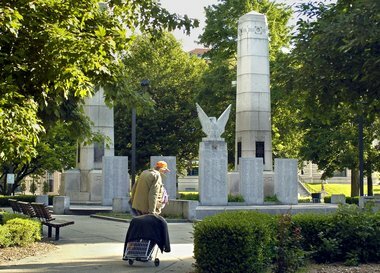 The DDA, which already had planned to improve nearby Monument Park, now also will take on Veterans’ Park upgrades. “We’re still trying to define the scope of work, but our general vision would be to do some improvements at Veterans Park as well as redo the public area in front of the Children’s Museum” at the 0.2-acre Monument Park, said Eric Pratt, a downtown planner with the DDA. “Our hope is to convene a working group of stakeholders and work with a landscape architect to develop an overall vision and goal for what weâd like to see happen in those two public spaces. The DDA will have to balance concerns of veterans with those of the park’s other stakeholders, including nearby residents, said Steve Faber, executive director of Friends of Grand Rapids Parks. “They see it as a place where they walk their dog, not as a place where they go and honor veterans,” Faber said. “Everybody sees that as valuable green space, and at the same time it has this unique purpose to it.